Vetrofond Ivory is a very nice colour. it has a beautiful, creamy consistency and is less violently reactive than Effetre Light Ivory. It's more of a true off-white, whereas some batches of Effetre Light Ivory (which I also have deep love for) has tendencies to a more orangey, light caramel colour. Vetrofond Ivory curdles and spreads less than Effetre Light Ivory. Vetrofond Ivory is a pale, neutral opaque colour. It can look somewhat translucent in thin layers, and in stringer form, it is more transparent than its Effetre cousin. Some batches of Vetrofond Ivory are more translucent than others, and there is a verry sheer batch out there that is known as 'Translucent Ivory' that is very nice indeed. Here, you can see that the reaction with silver is ever-so-slightly different with Vetrofond Ivory than it is with Effetre Light Ivory. On top of Vetrofond Ivory, silver does a little less spreading, and has more of a grey/brown appearance without the ethereal blueness that I got on top of the Effetre. 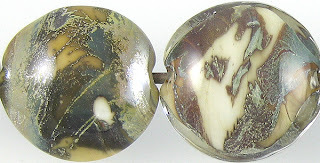 When the silver is reduced and encased, the portions of the Ivory that fumed brown with silver revert back to a more Ivory appearance, and the silver portions remain more or less the same colour. Silver glass is nice on Vetrofond Ivory. Here, my reduction frit got ever-so-slightly ringed with brown, and the TerraNova2 frit struck to blues and purples, also with a brown outline. Reducing the silver glass frit in the bead on the left fumed the Ivory to a slightly warmer colour -- sort of like toasting a marshmallow. Vetrofond Ivory reacts with other colours very similarly to Effetre Light Ivory. Ivory separates slightly on top of Tuxedo, and Tuxedo bleeds into it when used on top of it in stringer designs. Copper Green and Ivory have a reciprocal dark line reaction. A dark, greyish line reaction appears between Ivory and Opal Yellow. This reaction is darker and more pronounced when Opal Yellow is used on top of Ivory. Vetrofond Ivory makes Effetre Ivory separate. 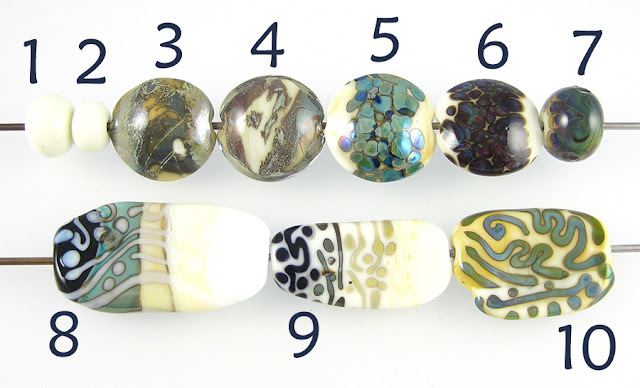 You can see this slightly in the bead on the right where the Light Ivory dots and stringer lines have darker pinpoints and streaks of colour in their centres. In the bead on the left, you can see the pronounced different tone of Vetrofond Ivory on top of the darker, more orange hue of the Effetre Light Ivory. There are no noticeable reactions between Ivory and Peace. The colours are so close that it's very difficult to even see where one begins and the other leaves off.